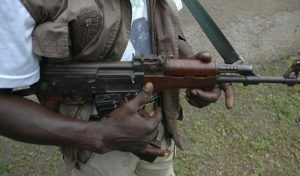 Authorities say unidentified gunmen on Tuesday night opened fire at police officers on duty -- under Operation Calm Life -- at Zen filling station at Kakpayili in the Tamale metropolis. The armed men suspected to be armed robbers fired at the officers who eye witnesses ran for their lives leaving behind their guns. It is not established if the unidentified armed men intended to rob the filling station or were targeting the guns of the police officers. Eye witnesses said the armed men were in a blue unregistered Camry when they fired several times to scare the police. The armed men made away with ammunition reportedly belonging to the police officers. It will be recalled that in 2018 three unidentified armed men stormed several filling stations within the Tamale metropolis which subsequently led to the setting up of Operation Calm Life. A night watchman was shot dead during the robbery least year at the same filling station that was attacked last night. The robbers fired at the police who were sitting in front of the filling station. The police took cover leaving behind their mobile phones and ammunition an eye witness narrated. Residents within the Kakpayili area are urging the police conduct a search in some houses to flush out suspected criminals who believed to be living in the area. The police are yet to comment on the matter. Northern regional police spokesman, DSP Yussif Tanko told Zaa News that investigations have commenced on the matter.